In Weimar the State Bauhaus was created in 1919 under the directorship of Walter Gropius from the Grand-Ducal Saxon School of Arts and Crafts founded by Henry van de Velde in 1906 and the Grand-Ducal Saxon Academy of Fine Arts. Its early years were still clearly influenced by the impassioned introspection of post-war Expressionism, as could be read in the first manifesto of 1919: "Let us therefore create a new guild of craftsmen without the class divisions that raise an arrogant barrier between craftsman and artist! Let us together desire, conceive and create the new building of the future, which will combine everything in a single form: architecture, sculpture and painting ... a crystalline symbol of a new and coming faith." After only a few years, however, signs of a polarization emerged at the Bauhaus which was viewed inside the school as a conflict between Itten and Gropius. Itten was thereby equated with "Indian cult, Wandervogel movement, vegetarianism", and Gropius with "Americanism, progress, the wonder of Technology and invention". The Bauhaus production principles of 1925 revealed no further trace of the mysticism of the Gothic stonemason's lodge. Gropius spoke instead of future crafts determined equally by technology and form and acting as a "medium of experimental work for industrial production". "The Bauhaus wishes to contribute to the development - appropriate to the times - of housing, from the simplest appliance to the finished dwelling. Convinced that house and furnishings must relate to each other rationally, the Bauhaus seeks - by means of systematic theoretical and practical research into formal, technical and economic fields - to derive the form of an object from its natural functions and limitations ... The nature of an object is determined by what it does. Before a container, a chair or a house can function properly its nature must be studied ... Such research into the nature of objects leads to the result that forms emerge from a determined consideration of all the modern methods of production and construction and of modern materials, forms which d'verge from existing models and often seem unfamiliar and surprising." 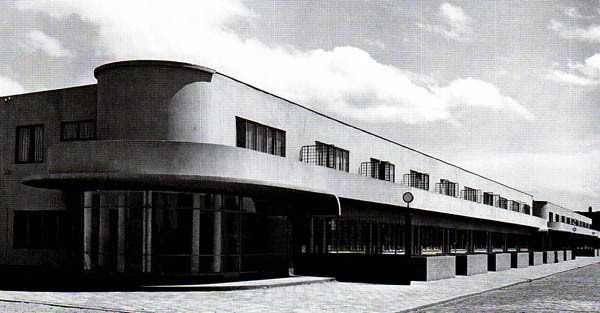 With the Bauhaus' move to the city of Dessau, Walter Gropius was given the opportunity to tailor a brand new building for the institute. 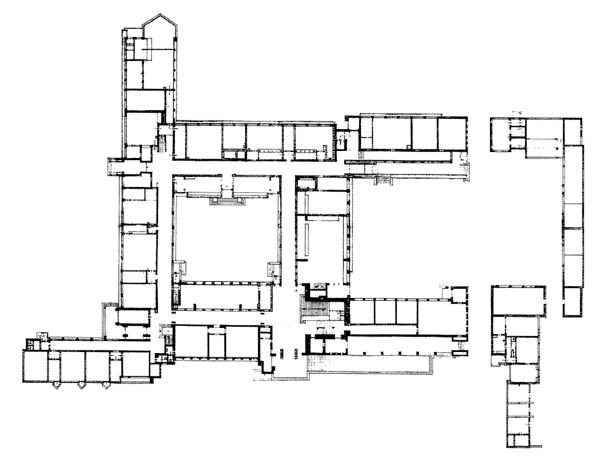 In fitting with Gropius' analytical standards, the entire complex was organized according to function. 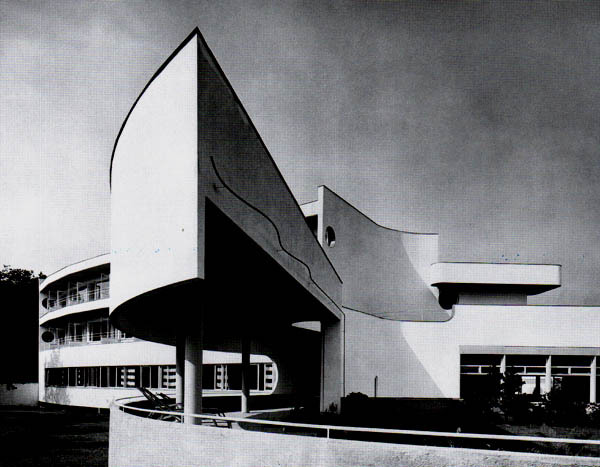 There was a workshop wing, an accommodation and studio block for Bauhaus students and a teaching wing for the Dessau Technical College, which was also to be housed in the Bauhaus complex by wish of the city magistrate. Gropius linked the three main sections, clearly differentiated in their external appearances, volumes and heights, through a raised administrative section and a lower connecting wing with auditorium, theatre and canteen to create a balanced, rectangular structure. The most spectacular element of the complex was the central workshop wing, clearly visible from afar. A delicate skin of glass held in a regular grid of slender black steel bars covered three sides of its reinforced-concrete frame. Its large prismatic body thus assumed a light, crystalline transparency. In addition to the new Bauhaus building, Gropius also built a Director's House and three semi-detached houses for the Bauhaus Masters; conceived as models of a new lifestyle in keeping with the machine age. They were based on the modular system of a "large-scale set of building blocks: houses which are composed of combinations of variable prefabricated off-the-shelf pieces." 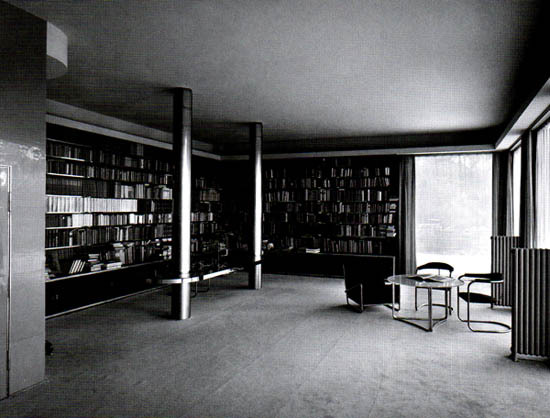 Although the goals of standardization and the industrialization of construction were not achieved in Dessau (his houses were in fact built in entirely conventional manner), the formal handling of volumes nevertheless convincingly demonstrates the aesthetic presence that can be achieved in the reduction to a few basic cubic forms. In Holland in 1917 the De Stijl group formed with the aim of creating a style valid for the "new consciousness of the age", which would replace the "individual" with the "universal". In painting this meant the rigorous rejection of all representational reference, including the Cubist and Purist. Nature was too material, too individual. "Universal" art allowed only for abstract composition, as an "equilibrium of position and weight of colour". The pictures by Piet Mondrian, the most important painter in the group, were reduced to straight black lines in rectangular arrangements, in conjunction with the primary colours of red, blue and yellow, supported by much white and some grey. The architects of De Stijl were concerned with the calculated distribution of unequal masses in an anti-cubist system which exploded the closed contours of volumetric bodies. In 1918 Jacobus Johannes Pieter Oud, then city architect in Rotterdam and a founder of De Stijl, described the role played by Frank Lloyd Wright and his ideas on the "destruction of the box": "Wright created the bases for a new plasticity in architecture. Masses shoot in all directions - forwards, backwards, to the right, to the left ... In this way, modern architecture will increasingly develop into a process of reduction to positive proportions, comparable to modern painting." One of the few buildings to consistently adhere to these maxims is the Schroder House built in Utrecht by Gerrit Rietveld, who joined the group in 1918. The basic form is cuboid, but is "de-composed" by horizontal projections and vertical wall slabs, parapet panels and supports. The right angle which Mondrian elevated to the level of dogma governs even the details: windows opening outward can thus only be secured in one position, namely exactly 90 degrees to the facade. The colour scheme is that of Mondrian: all linear elements are red, blue or yellow, while surfaces are white or grey. The large popularity which De Stijl achieved within just a few years was due above all to the painter and architect Theo van Doesburg, spiritus rector, organizer and driving force behind the group. He ran its magazine, organized exhibitions and travelled through Europe with his programme of lectures. It was his initiative, for example, which led in 1923 to an important exhibition in Leonce Rosenberg's avant-garde gallery "L'Effort Moderne" in Paris where, in addition to De Stijl projects, works by Mies van der Rohe could also be seen. Contacts with the Soviet Russian avant-garde were strengthened that same year when artist-architect El Lissitzky (who saw himself as an "artist-engineer") joined the group. Van Doesburg's attempt, in 1922, to cleanse the Weimar Bauhaus of its "Expressionist degeneration" through a full-scale "siege" failed miserably, however. Adolf Loos' primary concern lay not with abstract, formalist principles - he rejected drawing-board experiments - but with human proportions and reguirements, around which he sought to develop space. He designed room seguences not along the usual horizontal plane, but instead organized his plan on different levels. 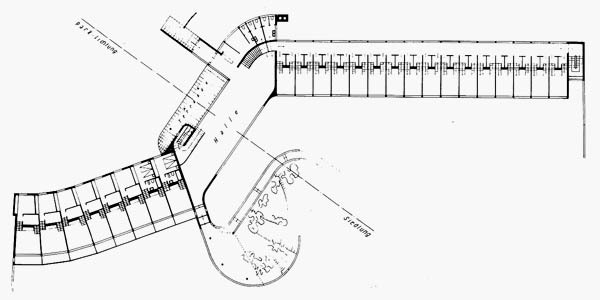 He found the rigid convention of regular storeys too narrow a strait-jacket; varying floor heights were subsequently among the most significant results of his thoughts on the "Raumplan" (volumetric plan). He "solved the plan in space", as he himself put it. Low, private niches thereby correspond via "neutral" intermediate levels to an open hall. The access to the living quarters is often very complicated and not always successful. Before reaching the so-called "small hall" in the Moller House, for example, the visitor will have gone round in at least one full circle, during which time he may have got rid of his hat and coat but will not have seen much more than the narrow vestibule behind the front door and the closed walls of the staircase -for it is necessary to pass the service flat, domestic quarters and garages before gradually approaching the centre of the house. The strict cube-symmetrical enclosures with which Loos clad his houses led, understandably if not inevitably, to a contradiction between interior and exterior. In his few completed houses, however, he pointed out the restrictions still affecting the designs of his contemporaries. Willem Marinus Dudok, (born July 6, 1884, Amsterdam, Neth.�died April 6, 1974, Hilversum), Dutch architect whose work is related both to the school of Amsterdam, which emphasized individual expression, and to the De Stijl group, which stressed geometric form. He attended the Royal Military Academy at Breda and remained in the army until 1913. 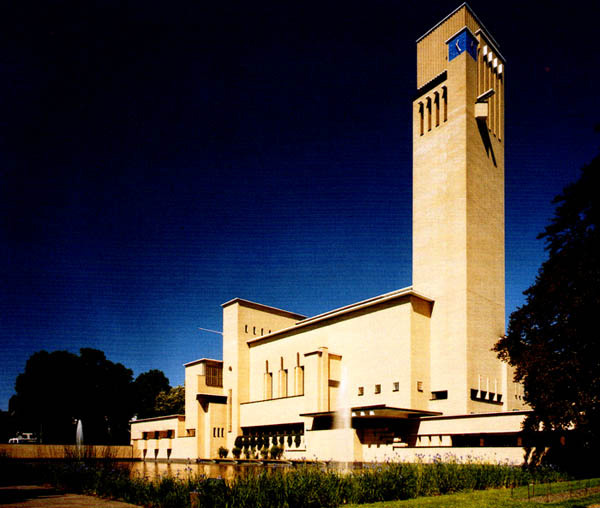 He became municipal architect of Hilversum in 1915 and thereafter designed many buildings for the city, notably the Dr. H. Bravink School (1921), the Vondel School (1928�29), and the Town Hall (1928�30). These structures, though compositions of cubes, convey solidity and texture through the use of solid brick. Other Dudok works include the Netherlands House, Cité Universitaire, Paris (1927�28); the Bijenkorf department store, Rotterdam (1929�30), which was destroyed in World War II; and the Erasmus Huis, Rotterdam (1939�40). Willem Marinus Dudok. 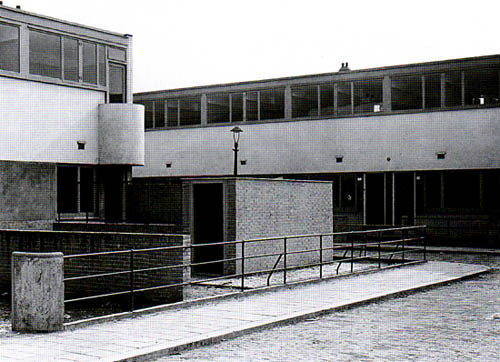 Dr. Bavinck School in Hilversum, The Netherlands, 1921-1922. Willem Marinus Dudok. Townhall in Hilversum. Jacobus Johannes Pieter Oud, (born Feb. 9, 1890, Purmerend, near Amsterdam�died April 5, 1963, Wassenaar, near The Hague), Dutch architect notable for his pioneering role in the development of modern architecture. Oud was educated in Amsterdam and at the Delft Technical University, after which he worked with a number of architects in Leiden and Munich. In 1916 he met Theo van Doesburg, and together the two men founded in 1917 the influential review De Stijl, which set forth the theories of the de Stijl group of avant-garde artists. 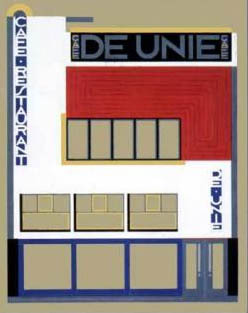 Oud soon became the chief proponent of the de Stijl idiom in modern architecture. Among his earliest architectural projects in this austere, highly geometric style were theoretical projects for houses at Scheveningen (1917) and for a factory at Purmerend (1919). 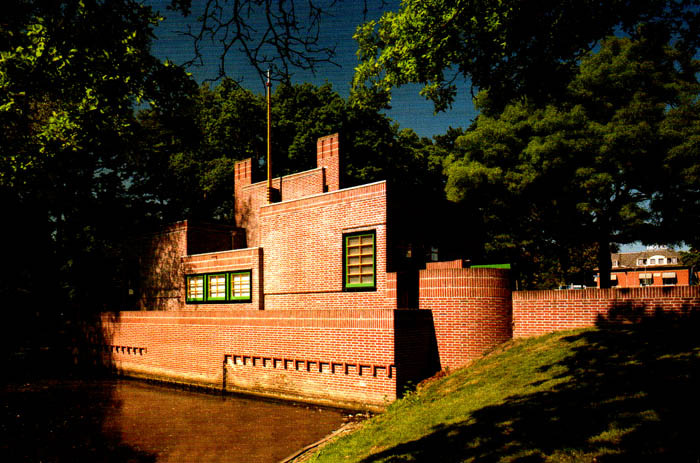 He designed a hotel at Noordwijkerhout (1917) and the Allegonda villa at Katwijk (1917). 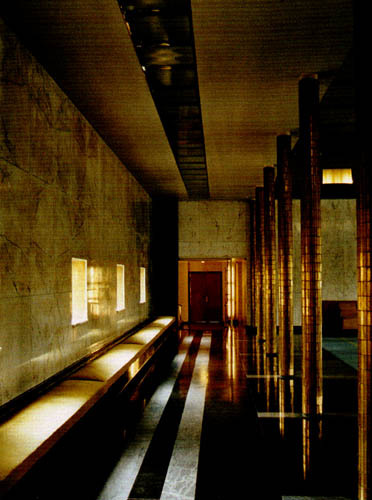 These and other buildings featured subtle oppositions of horizontal and vertical lines; long, straight walls wrapping into smoothly rounded corners; building units enclosing an open space; and simplified rectilinear and circular forms that achieve a subtly poised equilibrium despite their assymmetrical arrangement. In 1918 Oud was appointed housing architect to the city of Rotterdam, in which post he was required to supply sorely needed mass housing for workers. 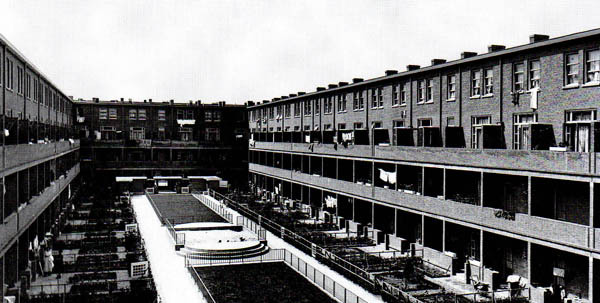 The housing blocks he subsequently designed and built at Spangen (1918), Tusschendijken (1920), and Hoek van Holland (1924�27) had a sober and functional austerity that contrasted strongly with the picturesque elaboration of detail typical of the school of Amsterdam led by Michel de Klerk. 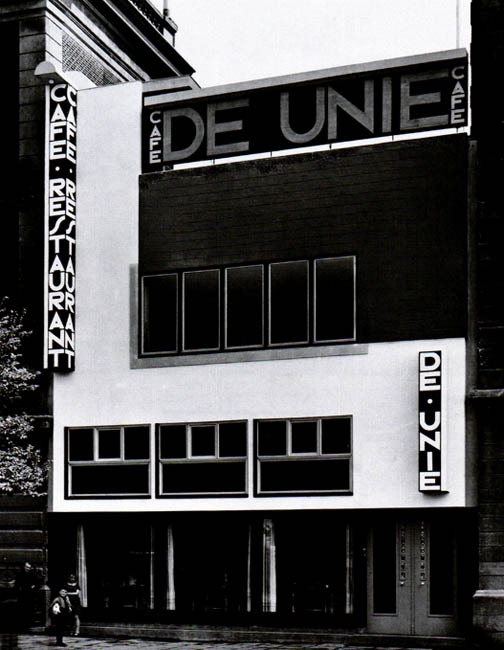 His Café de Unie (1924�27, destroyed in 1940) and Kiefhoek estate (1925�27), both in Rotterdam, also emphasized de Stijl principles, although by then he was tending toward separation from the movement. 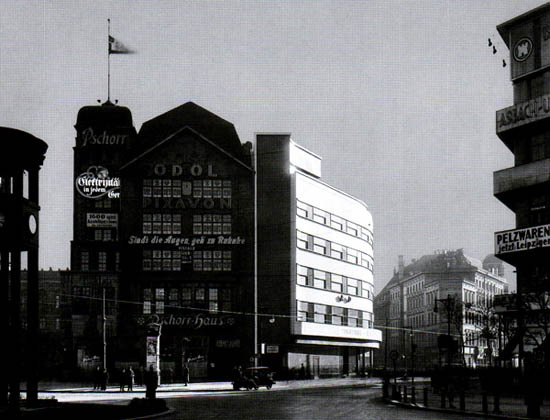 Oud�s book Höllandische Architektur (1926) gave him an international reputation. 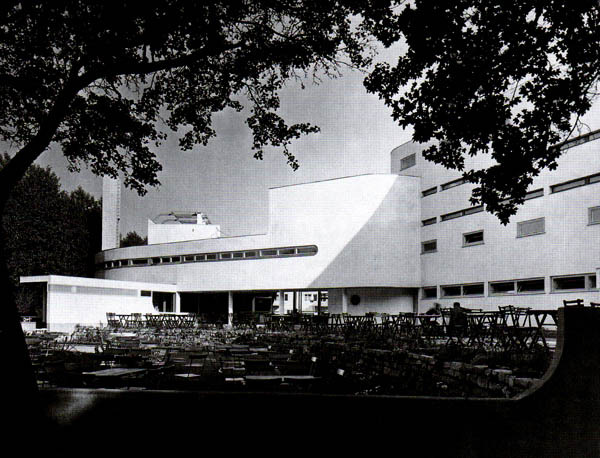 Among his late works are the monumental and somewhat ornate Shell Building (1938) in The Hague, which disappointed some because of Oud�s evident abandonment in it of de Stijl principles. The Bio-Children�s Convalescent Home (1952�60) near Arnhem, however, convincingly demonstrated Oud�s continuing mastery of the elegant geometrical compositions typical of what had become known as the International Style. Scharoun received his training at the Technische Hochschule in Berlin from 1912 to 1914. After World War I he became a follower of the Berlin architect Bruno Taut, and in 1925 he joined the group known as Der Ring, formed to defend the modern movement in architecture. 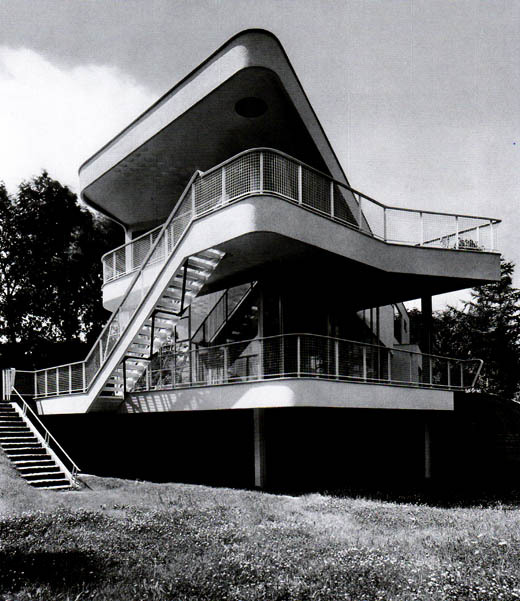 For the Deutscher Werkbund exhibition at Stuttgart (1927), featuring the work of prominent contemporary architects, Scharoun built a private residence. Among his outstanding projects before World War II were an institution for the aged at Breslau (1929), houses of the Siemensstadt Housing Estate in Berlin (1930), and the Schminke House at Löbau, in Saxony (1932). When the Nazis came to power, his architectural activities were severely curtailed, but after World War II he served in a number of government and academic posts related to town planning. Among his best known postwar works are the Geschwister Scholl Schule at Lünen, Westphalia (1955�62), and the multi-facetted Romeo and Juliet apartment buildings at Stuttgart (1963). Hans and Wassili Luckhardt, Alfons Anker. (June 16, 1890 in Berlin-Charlottenburg) � October 8, 1954 in Bad Wiessee) was a German architect and the brother of Wassili Luckhardt, with whom he worked his entire life. He studied at the University of Karlsruhe with Hermann Billing and was a member of the Novembergruppe, the Arbeitsrats für Kunst, and the Glass Chain. Together with Anton Lorenz, he designed furniture in the 1920s and 1930s, predominantly steel-tube and moveable chairs. From 1921 until his death he was in practice with his brother Wassili. From 1924 to 1934 their practice was also shared with Alfons Anker. 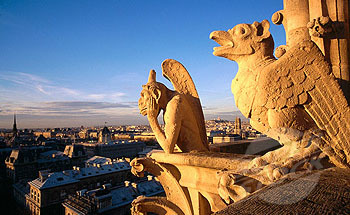 In the 1920s the brothers were among the world's top architects. Originally Expressionists, they later turned to Modernism. Their buildings are typical examples of Modernism, with skeletons of steel or reinforced concrete. During the Nazism era, the Luckhardt brothers tried initially to reconcile their architecture with the new ruling powers, even joining the Nazi Party. It quickly became apparent, however, that the new regime required a different architectural language. They were professionally disqualified, and only built three single-family houses during this period; the exteriors were made to blend in with the preferred style of the Nazi era. After World War II they tried to return to their pre-war work. From 1952 to his death, Hans was a professor at the Berlin State School of Fine Arts. (b. 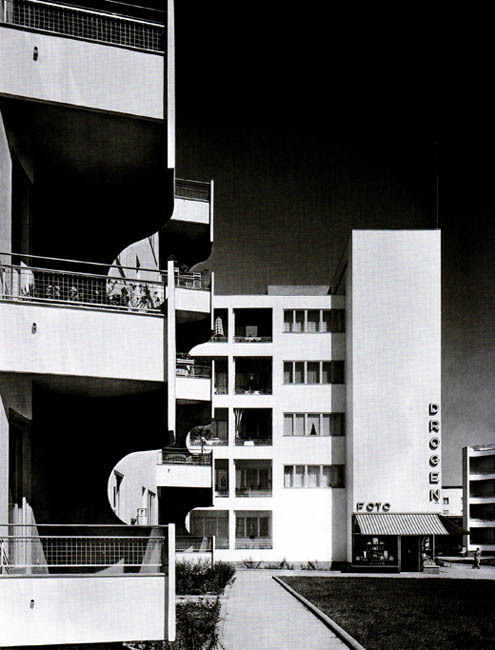 22 July 1889, Berlin; d. 2 December 1972, Berlin) was a German architect. He studied at the Technical University of Berlin (Technische Universität Berlin) and Dresden. Luckhardt and his brother Hans worked closely together for most of their lives. Both were members of the November Group (Novembergruppe), the Arbeitsrat für Kunst, the Glass Chain and, from 1926, the progressive architecture group Der Ring. The brothers shared an office with the architect Alfons Anker (b. 1872, d. 1952). In the 1920s the brothers belonged to the 20th centuries rising architects. Originally Expressionist they then turned to modernism. Their buildings are typical examples with skeletons of steel or reinforced concrete. During National Socialism the Luckhardt brothers tried initially to reconcile their architecture with the new ruling powers and joined even the Nazi Party. It quickly became apparent however that the new regime required a different architectural language. They were professionally disqualified and could only build three single family houses in this time, the exterior of which was made to blend in with the preferred style of the regime. After World War II they tried to return to their pre-war work. After the death of his brother Hans, Wassili ran the office alone. The 1959 competition for the Haus der Bremischen Bürgerschaft (city assembly in Bremen) was only realized after long discussions and repeated revision. In 1960 he was one of three architects shortlisted in a competition for the transformation of the Berlin Reichstagsgebäudes. Alfons Anker was born in Berlin in 1872. He practiced architecture in Berlin, first on his own, then in partnership with the Luckhardt brothers. This successful partnership came to an abrupt end in 1933 when his partners joined the National Socialist Party. In 1939 he managed to flee to Sweden, but never succeeded in re-establishing his career as an architect. Anker died in Stockholm in 1958. Hans and Wassili Luckhardt with Alfons Anker. 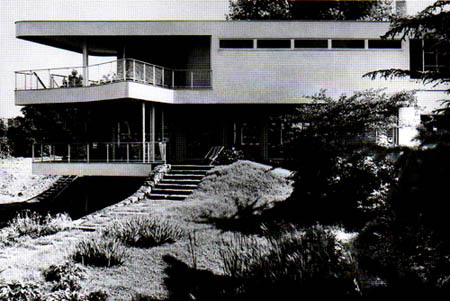 Villa Kluge, "Am Rupenhorn" in Berlin, 1928. Hans and Wassili Luckhardt with Alfons Anker. Villa Kluge, "Am Rupenhorn". Hans and Wassili Luckhardt with Alfons Anker.